A family based business in Geelong. Financial Aspects is a family based business servicing the Greater Geelong Area , Bellarine Peninsula and the Surf Coast. With over 40 years experience in financial planning and with Ron Rose senior at the helm Financial Aspects opened its doors in 1991. Jodi and Dan joined the company in 2003 and 2000 respectively and took over the business in 2008. At Financial Aspects, Jodi is passionate about helping individuals and families from pre-retirement right through their retirement years and finds this a very rewarding part of financial planning. Growing up in the Dandenongs but living and working in the Greater Geelong area over the past 15 years has given Jodi and her family (Husband Guy, 2 children Neyha age 9 and Decha age 6 plus various pets) the perfect opportunity to appreciate this wonderful region of Victoria. When not working hard looking after clients Jodi enjoys traveling and camping and sharing new experiences and cultures with her children, baking and attempting the art of bread making. Daniel entered the financial services industry in 2000 right as a recession hit and hasn't looked back since. 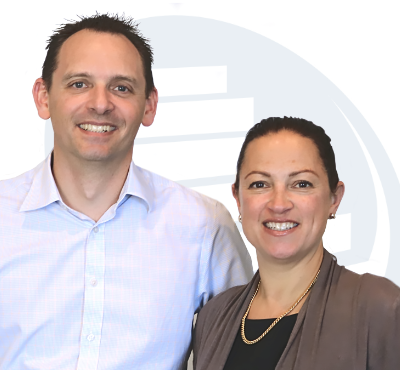 Specialising in superannuation advice and personal insurances Daniel keeps abreast of the ongoing changes and updates that affect most people from income insurance right through to superannuation investments. Daniel and family (Wife Sally, Austin 6 yrs, Fletcher 2.5yrs and Shultz the miniature Schnauzer) currently reside in Ocean Grove. Dan's a keen runner, sportsmen and gardener but more often than not can be found hanging out with kids.